What I found from trolling the internet was that there are many complex programs, many available in free versions, that visualize data. It is worthwhile for high school students to have some exposure to these, since they may be using them at work after they graduate. If had an opportunity, I would introduce one of these tools in a class so that students can gain some familiarity with how data is being manipulated nowadays. One of these new tools is Anteus (at http://www.antaeus-data.com/concepts/about.html). Antaeus is a system for finding patterns in multivariate data. It provides tools for looking at data when you don’t yet know what you’re looking for, led by your intuition and knowledge about the emergent phenomena represented. The basic plot type used is the scatter plot, as the number of variables increases, more and more scatter plots become necessary to visualize all the possible interrelationships. Anteus allows for complex manipulation of data sets with many variables and multiple dimensions. An example they have is for weather data where there is: Time, Location, temperature, wind speed, humidity, pressure, dew point, wind chill, and more. 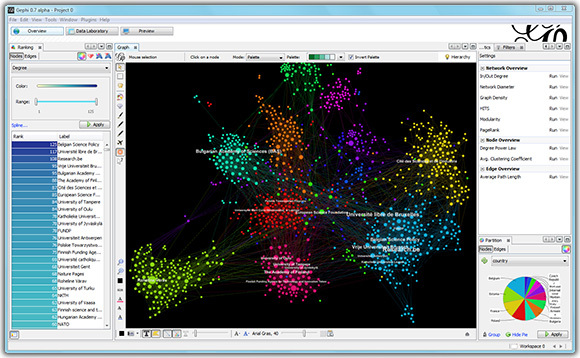 Another appealing tool is Gephi (at http://gephi.org). An open source visualization program is Ggobi (at http://www.ggobi.org). Seeing the separation between clusters in high dimensions by taking a helicopter tour in high dimension. Laying out the network graphically and linking it to other plots. There was also one appealing (commercial) program I found that was aimed at high school students. This was Fathom available at http://www.keypress.com/x5656.xml. It has more than 300 included data sets, which offer real information about a variety of subjects, so that learning using fathom is real world and authentic. Thank you for software review! These are so beautiful! I am going to play with Anteus with one of my students, who wants to be a meteorologist.